KAPLiN COMPANY is established in year 1977 and producing only flexible couplings since then. 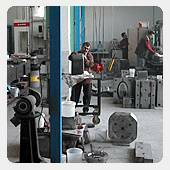 We are , therefore the most experienced company in Turkey. We produce a wide range and size of flexible couplings which answer the specific needs of different branches of industry. Our products has been safely used in Cement Factories, Textile Machinery, Paper Production Machinery, Machinery for Irrigation, Power Generators, Machinery Production and more. We have the ability and the technology to answer your specific needs and designs. For your specific design requests, we will be happy to serve you with our best.